iPress is a responsive magazine, news, blog, ad, review template. designed and development in grid system, flat design, fresh, modern, creative and clean. retina ready graphics. Boxed and full layout. Suitable for personal, news sites, bloggers, magazines. full responsive with modern navigation. 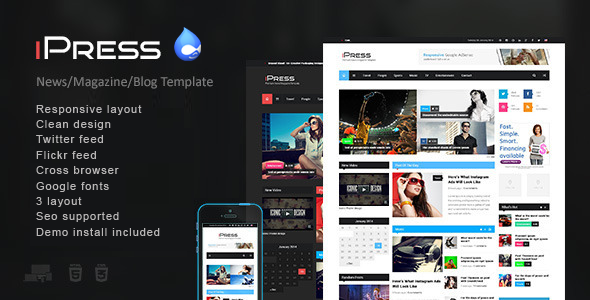 Item Reviewed: iPress - Responsive News Magazine Drupal theme 9 out of 10 based on 10 ratings. 9 user reviews.